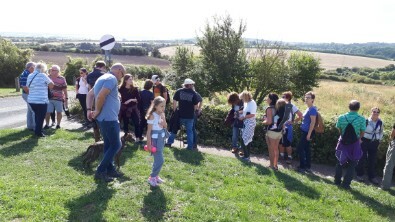 The annual Beating of the Bounds walk took place on Saturday 15th September starting from the Heritage Centre at 10:00 a.m.
Just under 40 adults and children including cub scouts, plus two dogs arrived to take part. It was a glorious morning so excellent for photography. Care was taken crossing over the roads on the route and climbing over the stiles at the top of the village. 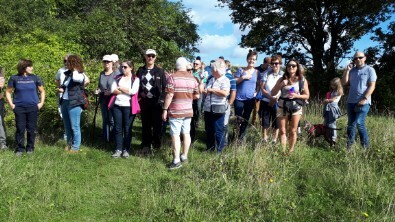 We started off by walking up the Avenue of Limes then turning right along the road to the edge of Swanley Park,keeping close to the hedge then through the waste land and the path by the right hand side of the rugby field. This brought us out to College Road where we took the footpath opposite,(next to the garden centre) then across the old boot fair field before squeezing through the gap to the track across Stanhill Farm to get to the telephone mast at the top of St Davids Road. We then walked along the footpath by the schools and out to Top Dartford Road. At the top of the hill we turned right to go down Goss Hill a short way before joining the waymarked footpath on the right hand side going over the stiles through the rough but well walked field to come out into Lower Road. We then turned right again to reach Durant Road where we took the footpath up the hill opposite swinging left and then right on the track past a line of trees to come up to Anthony Lane. At the bottom of the lane we turned right into Highlands Hill to come down opposite to Five Wents Hall. Here with our still large group we avoided further road walking back to the Avenue of Limes going along Main Road and crossing over to Egerton Avenue to come out into College Road leaving just a short distance back to the Heritage Centre. The distance recorded by one of our walkers was 5 miles and it took 2 and a half hours as we stopped frequently so everyone kept together for most of the way. Some peeled off at various points as they had other commitments later in the morning but those who continued enjoyed tea and cake at the Heritage Centre afterwards.